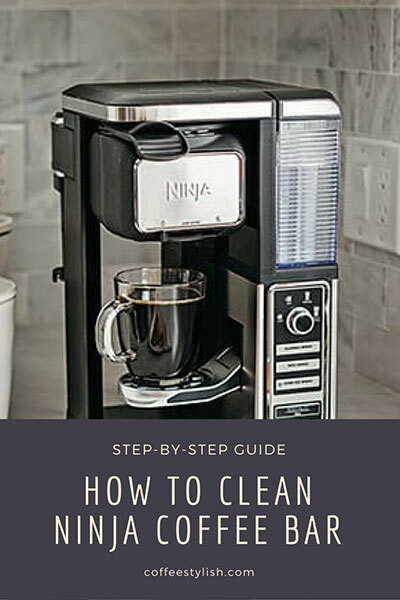 A detailed how-to on how to clean Ninja coffee maker to make it shine and keep it running efficiently. When the CLEAN light turns on, it’s time to descale your Ninja coffee maker. The recommended Ninja coffee bar cleaning solution is Full Circle Coffee and Espresso Descaling liquid. 1. Empty the water reservoir, filter basket and the carafe of any leftover water or coffee/grounds. Select full carafe size and set the empty carafe under the brew basket. 2. Pour in 1 bottle of Full Circle solution and add 32 ounces warm water (or if you have a model with a smaller tank – up to the MAX fill line). 3. Press the Clean button. The machine will start dispensing cleaning solution. Do not press any buttons or remove the carafe during this period. This process should take about 8 minutes. 4. After 8 minutes, remove and empty water reservoir and the carafe, and thoroughly rinse. Fill the tank to the MAX fill line with clean water only and place the tank and the carafe back. 5. Run two more clean cycles – press the clean button and once the entire reservoir is dispensed, discard water from the carafe and fill the tank once again with clean water. Repeat. You need to rinse the machine with 2 full tanks of clean water. When your machine is clean, the clean light should turn off. 6. Hand wash all removable parts with mild detergent, wipe the unit with a damp soft cloth, place everything back, fill the reservoir with fresh clean water and you’re ready to brew. 1. Empty the water reservoir, filter basket and the carafe from any leftover water or coffee/grounds. Select full carafe size and set the empty carafe under the brew basket. 3. Press the CLEAN button and let the machine sit for 1 hour. The machine will dispense water and pause a few times during this period. Just make sure you don’t press any buttons or remove the carafe during this period because it can stop the process. 4. After 1 hour, you should hear a beep and FLUSH message should appear on the screen. 5. Remove and empty water reservoir and carafe and thoroughly rinse. Fill the reservoir to the MAX fill line with clean water and place the reservoir and the carafe back. Press CLEAN button. You should do this within 15 minutes, so make sure not to wait for too long after the beep. Once you press the clean button, the machine should start dispensing the water and rinsing your machine. This will take about 8 minutes. Once it’s done, the clean light will turn off. 6. Remove all removable parts (water tank, carafe and brew basket) and hand wash with mild detergent. 7. Wipe the unit with a damp soft cloth, place everything back, fill the reservoir with fresh, clean water and you’re ready to brew. 2. Pour in 1 bottle of Full Circle solution (or 1 packet) and add 32 ounces warm water (or if you have a model with a smaller tank – up to the MAX fill line). 4. After 1 hour, you should hear a beep and the CLEAN light will turn off. 5. Remove and empty water reservoir and carafe and thoroughly rinse. Fill the reservoir to the MAX fill line with clean water and place the reservoir and the carafe back. Make sure the machine is set to the full carafe and press CLASSIC BREW cycle to rinse the machine. Repeat with another full reservoir of fresh water. 6. Remove all removable parts (water tank, carafe and brew basket) and handwash with mild detergent. 7. Wipe the unit with a damp soft cloth, place everything back, fill the reservoir with fresh, clean water and enjoy! If the clean light still illuminates after a clean cycle, this usually means there is still calcium build up in the brewer. You need to repeat the descaling process and the clean light will automatically shut off when the machine is clean and free of calcium build up. If the problem persists after that, I recommend calling Ninja customer service at 1-877-646-5288. For some reason, Ninja machines have problems with clean lights and this often happens. Discard the grounds and hand wash the carafe and the filter basket with a mild detergent after each use, or at least once every day. This will take less than 1 minute but it will keep your machine clean, oil and germ-free. Be sure to allow the brewer to cool before cleaning. 1. Empty the carafe and the filter basket of leftover coffee/ grounds. 2. Remove all removable parts and hand wash them with mild detergent or place in the dishwasher on the top rack. The permanent filter, water reservoir, the lid and the glass carafe are dishwasher safe. The thermal carafe and brew basket are not dishwasher safe. 3. Wipe the unit with a soft damp cloth. Put everything back, and fill the reservoir with clean fresh water. Ninja’s improved coffee maker is its best one yet, and it’s packed with features and capabilities. Read a full review here. 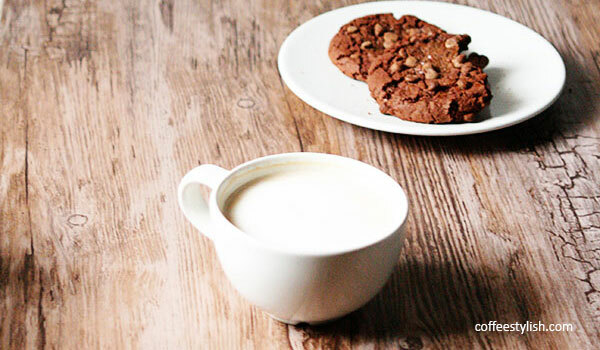 If you love coffee as much as I do, here’s a list of delicious coffee recipes that you can easily make at home with your Ninja coffee bar. Can I use tap water, or does it have to be distilled water to clean? Hi Leslie, yes, you only need a descaling solution and tap or filtered water. You don’t need distilled water. Hi Laverne, if the clean light still illuminates after a clean cycle, this usually means there is still calcium build up in the brewer. You need to repeat the descaling process and the clean light will automatically shut off when the machine is clean and free of calcium build up. If the problem persists after that, I recommend calling Ninja customer service at 1-877-646-5288.
what if after pushing the cleaning button and it only runs 15 seconds and stops until you push the cleaning button again? Hi John, unfortunately, Ninja coffee makers can have a problem during the cleaning cycle for some reason. Some of my readers also had this problem. I recommend calling Ninja customer support at 866-826-6941 to help you troubleshoot your machine.